UPDATED: Sat., Feb. 9, 2019, 9:28 p.m. The first 5 minutes determined the final result. 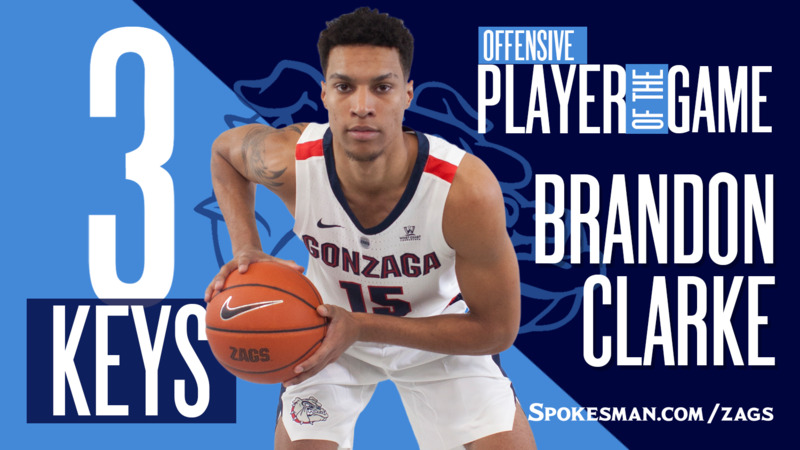 It was a 17-4 lead after Brandon Clarke knocked down his fourth 3-pointer of the season. Everything the Zags did worked. Their offense and defense dominated from the start. Clarke, fresh off setting the school’s record for blocks in a season, was jumping all over the place. He finished with 24 points, with all but three coming inside the paint. He also added two assists and two offensive rebounds. Rui Hachimura led both teams with three steals and blocked two shots, all while picking up only two fouls in 24 minutes. He owned the paint, not allowing anything easy and helping to limit the Gaels to 18 points down low. Published: Feb. 9, 2019, 9:18 p.m. Updated: Feb. 9, 2019, 9:28 p.m.